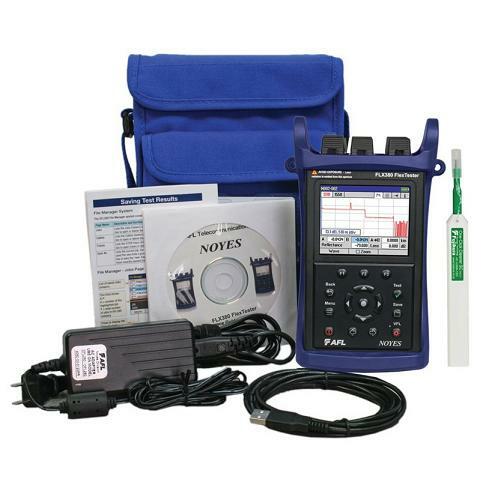 The NOYES FLX380 FlexTester is the world抯 smallest, lightest, most complete single-mode fiber optic test set. It combines high-performance, PON-optimized, multi-wavelength OTDR/PON OTDR, OLS, OPM, VFL and PON Power Meter in a rugged, hand-held package. FLX380-103: Most complete high-performance test set for verifying both in-service (live) and out-of-service FTTx PONs. Includes ServiceSafe?live PON detection, integrated PON power meter and 1625 nm filtered live PON OTDR, all from a single port. Over 1000 OTDR test results may be saved in industry-standard .SOR file format. Stored OTDR and OPM results may be transferred to PC via USB port for viewing, analysis, and professional report generation using the included Windows?compatible Test Results Manager (TRM? software. FlexTester PRO Test & Inspection Kit ?Combines user-specified FLX380 FlexTester with standard accessories plus FOCIS Fiber Optic Connector Inspection System and optical connector cleaning supplies into a rugged, waterproof hard-shell carry case. FlexTester with Soft Carry Case ?Combines user-specified FLX380 FlexTester with standard accessories and One-Click Cleaner into a convenient, lightweight soft carry case. All FLX380 kits include rechargeable, replaceable Li-Ion battery pack, AC charger with country-specific power cord, (1) SC and (1) FC adapter for the OTDR/OLS port, (2) 2.5 mm Universal adapters for the OPM and VFL ports, dust caps for all ports, USB cable, TRM?Test Results Manager software, and a quick reference guide in any one of the supported languages. Prepaid Cal plans offer two annual calibrations at a discounted price. Cal Plus plans offer the same services as the Cal plans with the addition of a two year extended warranty (three years total coverage).